1. Jambox by Jawbone: A speaker that connects wirelessly to his iPhone, because boys like anything that's wireless. 2. Mini Robot Vacuum: He loves robots. You love when he cleans up his crumbs. This tabletop vacuum does both! 3. Polo: A red polo says "Valentine's Day" without screaming, and it saves him a shopping trip. 4. Ron Swanson Card: This printable from Etsy tells him exactly how you feel. 5. Apple TV: Wirelessly connects all of your Apple products to your TV. Man approved by my boy, he was super excited when I got one for him. 6. Archer Season 3: Because what says "romance" more than a dead fiance coming back as a murdering cyborg? 7. Heart Boxers: Super cute, and since he never shops he'll probably actually wear them. Of course, if hearts are a little too girly for your boy, try some red plaid shorts instead. 8. Rapid Beverage Chiller: This little guy chills a can of beer 40x faster than in the freezer. Added bonus: it also fits a bottle of wine. What are you getting your guy for Valentine's Day? I'm totally with you on number 9–food is the way to any man's heart! Such great ideas! MY guy would love 5,8, and 9. This is such a great idea! Guys are hard to shop for! I love the vacuum robot! and the heart boxers are so cute! I think I'm going to make my bf a gift this Valentine's Day (just like the last one, too!) since he really likes that kind of stuff. Food is always a great option, too- but it's so overdone I feel like. Number 4 cracks me up and number 8 is a genius idea! Ohh I didn't even think about the gift for my hubby, its always so hard! Yep! The homemade cookies will always take the cake for my guy. 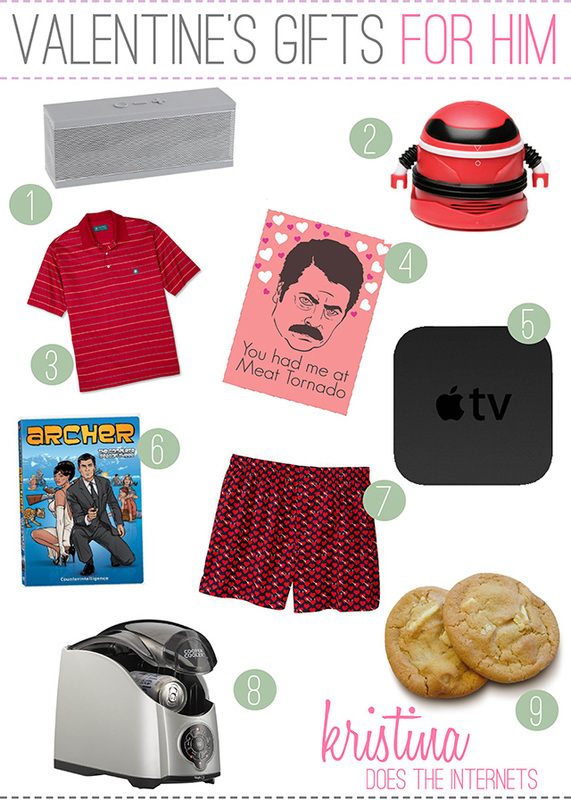 I want that mini robot vacuum for ME :) Such cute gift ideas! oh my gosh that ron swanson card is totally awesome!! what a guy's guy card that is, great male valentine's day gifts you have collected! Thanks for the post! This is very helpful since every year I don't know what to get my boyfriend! I don't create many comments, however i did a few searching and wound up here "Valentine's Day Gifts For Him". And I do have a couple of questions for you if it's allright. Is it only me or does it give the impression like a few of the remarks appear like left by brain dead visitors? :-P And, if you are writing at other sites, I would like to follow anything new you have to post. Could you make a list of all of all your social pages like your linkedin profile, Facebook page or twitter feed? problems with your RSS. I don't know why I can't join it. Wow! This blog looks exactly like my old one! It's on a totally different subject but it has pretty much the same layout and design. Superb choice of colors! journal on a daily basis. I'd like to start a blog so I can easily share my own experience and thoughts online. Please let me know if you have any kind of recommendations or tips for brand new aspiring blog owners. Thankyou! a daily basis. It's always helpful to read through content from other writers and practice something from their websites.